Doug Perkins has been declared a “percussion virtuoso ” by the New York Times and founded So Percussion and the Meehan/ Perkins Duo. He also performs regularly with Signal, eighth blackbird, and regularly works with John Luther Adams, Tristan Perich, Steve Riech, and countless other composers and ensembles. Doug’s recordings can be heard on the Bridge, Cantaloupe, Harmonia Mundi, New Focus, and New World labels. His productions of Persephassa in Central Park Lakeand John Luther Adams’ Inuksuit were named Top Ten Performances in 2010 and 2011 by the New Yorker, New York Magazine, and Time Out NY. Doug is on the percussion faculty of the Boston Conservatory at Berklee, the Director of the Chosen Vale International Percussion Seminar, served with eighth blackbird as Artist-in-Residence at the University of Chicago, and was previously on the faculty of Dartmouth College. Mr. Berg is currently the Percussion Director and Steelband Director at Naperville Central High School in Naperville, IL, the Percussion Director of the Lincoln-Way Community Marching Band in New Lenox, IL, and the Front Ensemble Coordinator for The Academy Drum & Bugle Corps from Tempe, AZ. He is a proud endorser of Innovative Percussion sticks and mallets. Mark Eichenberger is a freelance percussionist and educator based out of Lawrence, New Jersey. He holds a DMA in Percussion Performance from the University of Illinois at Urbana-Champaign. Mark is a regular performer for the Princeton Sound Kitchen premiering new works by composers at Princeton University. As a teacher he works with the percussion programs at Hunterdon Central and Hopewell Valley High School and maintains a private lesson studio in the Princeton area. Before moving to New Jersey, he worked at the University of Texas-Brownsville as a lecturer of percussion and prior to that appointment was a freelance performer and teacher in Chicago. He also currently serves as the Front Ensemble Arranger and Percussion Coordinator for The Academy Drum and Bugle Corps, where he has worked since 2013. Michael Compitello is a dynamic, “fast rising” (WQXR) percussionist active as a chamber musician, soloist, and teaching artist. He has performed with Ensemble Modern, Ensemble Signal, Ensemble ACJW, and has worked with composers Helmut Lachenmann, Nicolaus A. Huber, David Lang, John Luther Adams, Alejandro Viñao, Marc Applebaum, and Martin Bresnick on premieres and performances of new chamber works. With cellist Hannah Collins as New Morse Code, Michael has created generating a singular and personal repertoire through long-term collaboration with some of America’s most esteemed young composers. He also champions new and recent works for solo percussion in the US and abroad. Michael is Assistant Professor of Percussion at the University of Kansas. Michael earned a DMA and MM from the Yale School of Music, and a BM from the Peabody Conservatory. From 2009 to 2010, Michael performed and studied contemporary chamber music with the Ensemble Modern and the International Ensemble Modern Academy in Frankfurt, Germany on a Fulbright Grant from the US Department of State. David Degge’s artistry combines virtuosity on percussion instruments, a collaborative spirit in ensemble music, dedication to mentorship, and the determination to carve out a new repertoire for the hammered dulcimer. His most recent project, Andrea Mazzariello’s Home Body, was released this summer alongside Mazzariello’s vocal percussion quartet Symmetry and Sharing on One More Revolution Records. 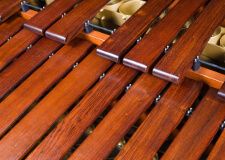 Further upcoming projects include a new solo percussion work by Aurél Holló of the widely acclaimed Amadinda Percussion Group, and a new solo for hammered dulcimer by Jason Treuting, both slated for premiere this season. David currently lives in New York City where he works as a freelance percussionist and teaches percussion privately in various capacities. He is the Percussion Teaching Fellow at the Bard College Conservatory of Music and also teaches in Bard’s Preparatory Division. He is a proud endorser of Vic Firth sticks and mallets.